Obesity is not the same as being overweight. Obesity means you have too much body fat, which greatly increases your risks for obesity related health problems. Rather than being just a cosmetic concern, obesity is a chronic medical disease that diminishes almost every aspect of your health. At a healthy weight, our bodies, including our brains, muscles, bones and heart, can function efficiently for many years. Obesity decreases the quality of life and can significantly reduce your life expectancy. 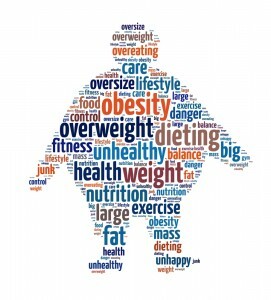 Obesity can lead to diabetes, coronary heart disease, high blood pressure, metabolic syndrome and some types of cancers. Unfortunately, in the United States obesity has reached epidemic proportions. Over 300,000 deaths each year can be directly related to obesity. Body mass index (BMI), determined by both weight and height, is strongly correlated to body fat content in adults. A BMI of 25 – 29.9 is considered overweight, while a BMI above 30 is considered obese. For those with a BMI over 40, life expectancy can be reduced by as much as 20 years for men and 5 years for women. Many factors contribute to obesity. These can include overeating, a diet too high in simple carbohydrates, physical inactivity, medications, lack of sleep, disease and genetics. Where body fat is located is of significant importance. Men, who tend to carry extra weight in the abdomen, are more likely to develop health problems associated with obesity while women, who often carry extra weight on their hips, may have less health risks related to obesity. Men with a waist measurement of 40″ or greater and women with a waist measurement of 35″ or greater are considered to have increased health risks. Metabolic syndrome – A diagnosis of metabolic syndrome means you have at least three factors that can lead to heart disease, diabetes and stroke. These include abdominal obesity, high blood pressure, high levels of blood fats, inflammation and high blood sugar. Fat cells, especially those located in the belly, secrete hormones that stoke the fires of inflammation. Chronic inflammation causes a variety of health problems. Approximately one-third of obese or overweight Americans exhibit metabolic syndrome. Type 2 diabetes – Those who are even moderately obese can develop insulin resistance, which effects the way the body metabolizes fats and carbohydrates and leads to high blood sugar levels. Type 2 diabetes is a leading cause of early death, stroke, kidney disease, coronary heart disease and blindness. Abnormal blood fats – Obesity puts you at an increased risk of high levels of triglycerides, high levels of LDL (bad) cholesterol and low levels of HDL (good) cholesterol. These high levels of blood fats increase your chances of developing coronary heart disease. Heart disease – With obesity your chances of developing hardening of the arteries, known as atherosclerosis, increases tenfold. Narrowed arteries and decreased blood flow to the heart can cause heart attacks and stroke. Stroke – Obesity can lead to a buildup of arterial plaque, which can rupture and form blood clots and increase the risk for stroke. The stroke risk increases as your BMI increases. Cancer– For a woman, being overweight increases the risk of breast, colon, gallbladder, endometrial and uterine cancers. For men, obesity increases the risk of colon and prostate cancers. Obesity can also increase the risk of depression, infertility, respiratory disease, and musculoskeletal disorders. The good news is that obesity doesn’t have to be a permanent condition. Weight reduction of 5 – 10% of your body weight and long term maintenance of that weight loss can bring significant health gains. It is not necessary to reach an ideal weight but rather a healthier weight, which can bring reduced risks of all of the above mentioned health problems. The goal for a healthier lifestyle should include eating a healthy, whole food diet, getting 30 minutes of exercise daily , drinking plenty of water and getting a good night’s sleep. Remember, you have to eat well to be well. To further improve your health risks, don’t smoke, drink alcohol moderately, take some time to play and socialize and once you’ve reached a healthy weight, maintain, maintain, maintain! The following products may be useful to those who have symptoms relating to metabolic syndrome. UltraMeal Plus 360 Medical Food Vanilla by Metagenics addresses the management of conditions linked to metabolic syndrome with a clinically tested, low glycemic index medical food. Researched based ingredients are designed to support blood sugar levels, blood lipid metabolism, healthy homocysteine levels, healthy cholesterol levels and management of triglycerides and fasting insulin levels. Diabet Support Pack™ by Douglas Laboratories contains synergistic vitamins, minerals, herbs and nutrients such as omega-3 fatty acids, standardized extracts, CoQ10 and antioxidants in support of healthy blood sugar metabolism. Advanced Inflammation Control by Complementary Prescriptions provides a comprehensive formula to help maintain a balanced inflammation response. This herbal and plant based formula is designed to combat inflammation triggered by obesity, lack of exercise, stress, sleep deprivation, poor diet or other not so healthy lifestyle factors. Niacin 100™ by Biotics Research contains vitamin B3 recognized as a cardio-protective agent in support of increased HDL cholesterol, lowered triglycerides and decreased vascular inflammation. This entry was posted in Home and tagged Advanced Inflammation Control by Complementary Prescriptions, Diabet Support Pack™ by Douglas Laboratories, Niacin 100™ by Biotics Research, obesity, UltraMeal Plus 360 Medical Food Vanilla by Metagenics. Bookmark the permalink.